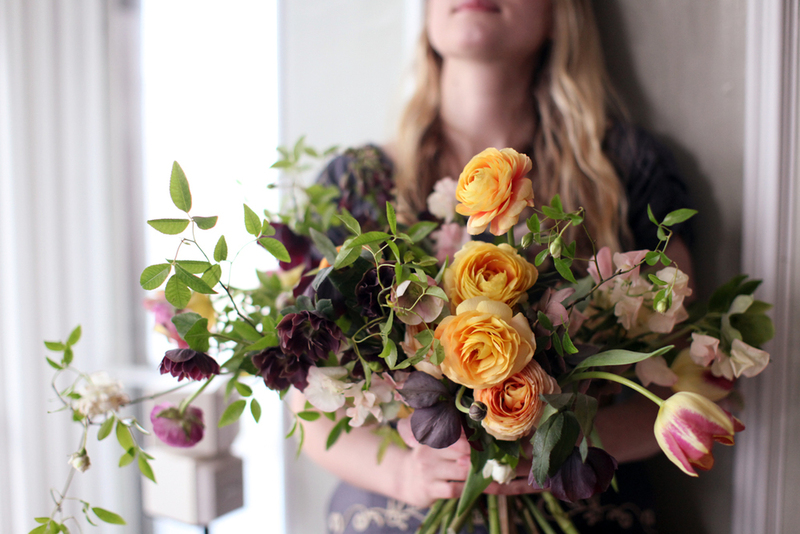 In this unique intensive workshop, we'll dive deeply into our flower practice & businesses; shake things up a bit and see where the pieces fall. Consider it a spring cleaning, opening up the windows and giving your creativity & business a good old airing out. Over the course of two days we'll fully immerse ourselves in design work focusing on expanding, elevating and honing our artistry and technique. We'll work with each student to identify where they tend to get stuck and where they tend to flow in their floral work. We'll emphasize color, balance and form; and, as always, this workshop is designed to push the limits of your creative process with flowers. Using the most beautiful flowers* April has to offer, we'll dive in straight away with the construction on large scale arrangements. Nicolette and Sarah will demonstrate building a massive arrangement while sharing their methods tips & tricks on how to achieve balance, elegance and movement on a grand scale. Each student will have a wrought iron urn in which to build a large, sprawling 2 meter high (or more?) arrangement using spring flowering branches and blooms. If you wonder how we do this without the use of floral foam; this is your chance to learn. In the afternoon we'll shift gears to creating table top centerpieces. We’ll demonstrate our loose, romantic and unstructured approach to making elegant centerpieces in a shallow compote without the use of foam. Students will spend the afternoon creating their own work to be styled and photographed for their portfolios on the final day of the workshop. During day two we’ll practice the art of composing distinctive bridal bouquets (students should expect to make a bouquet, and then make it again) crafting boutonnieres, tricks for constructing hair pieces and crowns, and techniques for avoiding wrist corsages. The late afternoon, when the light is just right, we’ll finish by photographing the students work for their portfolios. Our venue, The House Nextdoor has 5 floors of wonderfully textured surfaces and phenomenal natural light. Each room will be bursting at the seams with beautiful flowers as our 10 students spread in the house to work for two days. Intermittently between arranging we'll pause for lectures by Sarah and Nicolette on building and growing flower businesses, on managing clients and hired help, and keeping true to your art and ideals. These semi-formal talks will give way to looser Q&A sessions in which you can broach topics specific to your own struggles and achievements. Cost of workshop is $2,600USD including all materials (flowers, clippers, table top vase), lunches each day, coffee/tea breaks and champagne of course. Register HERE. *In preparation for our classes in the UK we will be traveling to Aalsmeer to visit the international flower market, and ship special materials to London. As always, we will also rely heavily on local materials collected from around the London area. **Interior photos courtesy of Castle Gibson.